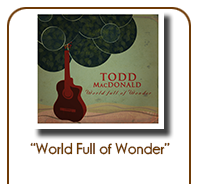 A graduate of Gordon-Conwell Theological Seminary (Master of Divinity), Todd MacDonald writes songs with the thoughtfulness and heart of a true minister. Currently living in Nashville, TN, he has just released his debut album, Pilgrims Here (co-produced with Paul Buono). Born and raised outside of Boston, MA, Todd received his first guitar as a high school graduation present from his parents. 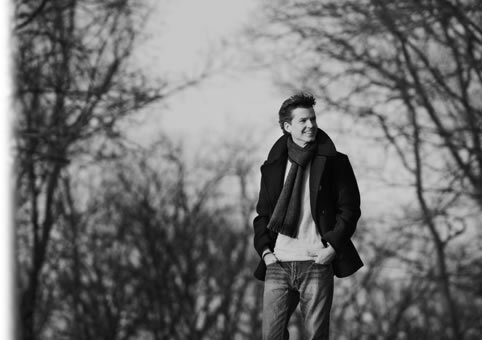 Later that year, as a first-year art major at Boston University, he made his first tentative attempts at songwriting. Over time, Todd’s writing became noticeably more God-centered as he began to sing about his life of faith – both its joys and its struggles – and to pour out his heart to God in prayerful song. Upon graduating from seminary in 2004, Todd moved to his present home in Nashville, TN, to further devote himself to a ministry of music. In January of 2009, Todd was diagnosed with a rare form of cancer called Peritoneal Mesothelioma. Treatment began with major abdominal surgery and was followed by many months of chemotherapy. His next surgery is scheduled for the second week of January 2011, and will be followed by additional chemotherapy. As the apostle Paul writes, “We do not lose heart. Though our outer nature is wasting away, our inner nature is being renewed day by day. For this slight momentary affliction is preparing for us an eternal weight of glory beyond all comparison, as we look not to the things that are seen but to the things that are unseen. For the things that are seen are transient, but the things that are unseen are eternal” (2 Corinthians 4:16 -18). As he is able, Todd continues to sing his songs for live audiences, whether at writer’s nights around Nashville or in churches around the country.